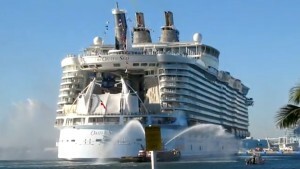 Two of the world’s largest cruise ships have arrived at their new homeport, Port Canaveral. Norwegian Cruise Line’s massive Norwegian Epic with a capacity of 4,100 people joined another behemoth, the 5,400-passenger mega-cruise ship Oasis of the Seas over the weekend. Oasis had just started its first sailings from Port Canaveral. The ship arrived at the port a week earlier. Royal Caribbean’s Oasis of the Seas will relocate to its new home at Port Canaveral.